Ever felt a need to have screenshots of your computers screen. There are many applications for that, but if you wanted to have screenshots at regular interval then what would you do? 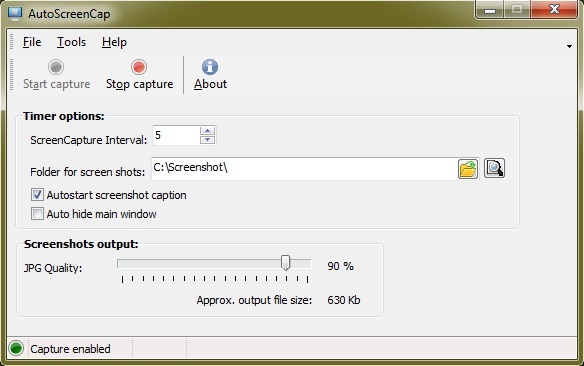 AutoScreenCap is a computer utility that takes screenshots of your computer screen at regular intervals which can be specified by you. To set-up your automated image capturing application, you just need to alter some settings. Firstly, change the ScreenCapture Interval, this is the value in seconds and is used to set the interval between each successive screenshot. Secondly, set the folder location where you want your screenshots to be saved. Next change the picture quality. The higher the quality, the greater will be the image size. The application also shows the approximate file size according to the quality you select. When all the settings are done click the Start Capture button and the application will start taking screenshots of your screen according to the time interval you specified in the first step. The application is quite useful when you need to make someone understand a procedure or some instruction are to be given for using something. AutoScreenCap works on both 32-bit and 64-bit versions of Windows XP, Vista, Windows 7 and Windows 8.